You can't recognize the good times if you never have any bad times. If you're planning a wedding then you've probably had many a person tell you that SOMETHING will go wrong at your wedding. 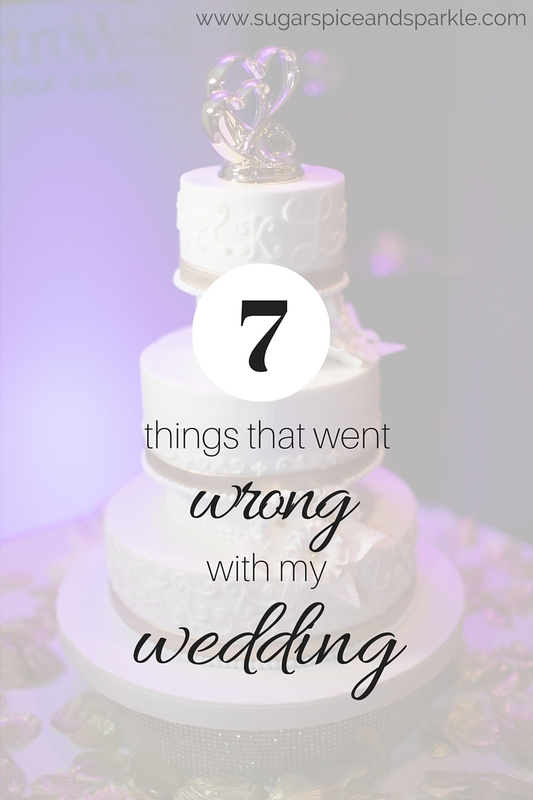 So today I am sharing my "bad times" of wedding planning and what went wrong on the big day itself, so that someday when I look back on this blog diary of mine I can appreciate how wonderful everything was despite the inevitable bumps in the road. Also to give any brides-to-be reading this re-assurance that it will be OKAY! 1. Our wedding co-ordinator left. Yep, no typos there. The wedding co-ordinator at our venue ended up getting transferred to a different venue a few months before our wedding. We had already gone through everything with her, all of the details of the day, the timeline, the concessions she was willing to make for us. When we found out about the new person, we had to meet with her to bring her up to speed on everything. 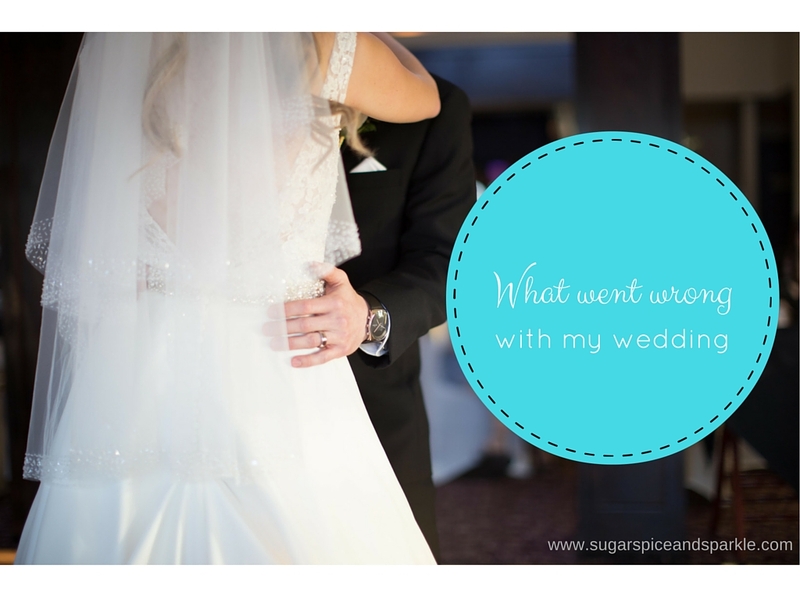 Writing this now I'm thinking "no one is going to think this is a big deal" but I ask you to think back to when you were planning your wedding, and imagine out of the blue getting an email that the person in charge of your wedding reception is leaving. Yeah. Not fun! But... it alll ended up working out because the original woman came back for our actual day and everything went smoothly! 2. The priest we wanted retired. We hadn't asked him to do our wedding yet but we were planning to, but one Sunday sitting in church he announced his retirement was to be just 2 months before our wedding. We were bummed. But, once again, the priest we ended up having was amazing and made our wedding special! They say everything happens for a reason, and I'm a firm believer in that. 3. Someone got BLOOD on my wedding dress. I know your heart just stopped, as mine did when the lady pinning my dress for alterations pricked her finger and got blood on the beaded top of my wedding dress. I tried not to freak out, but I'm pretty sure my face was the same color as my dress at that point. Luckily the blood mostly came off and then that part ended up getting cut off to fit me anyways. But I didn't know that in the moment, and I. was. freaked. 4. The music director at our church went MIA. This happened about a month before the wedding day. Our church was going through some changes at the time and apparently the music director (who's wife also ran the rehearsal's and helped out day of) left. No notice to us, we only found out because we were trying to get a check to him and for several weeks in a row he wasn't at church on Sunday. So we did a little digging and the church said they were working on finding someone else. Working on?!? We had checked ceremony music off the list. We were done with that! Now we had to start all over! Thank God that my hubby is awesome and took that on as his project. He co-ordinated with soooo many people to get us our piano player, violinist, cantor, and someone to run the rehearsal and help get everyone down the aisle on the big day. Luckily the music was so beautiful, even though the first time I was seeing and hearing them was as I walked down the aisle. 5. They didn't cut the whole cake. Our cake place has a really cool thing where they give you a free mini cake on your 1 year anniversary so you don't have to freeze your top layer and eat it a year later (as tradition goes). Our venue didn't get the message I guess because they never cut the top layer of our cake. So there were about 25 pieces that didn't get cut. Everyone still got cake but I'm assuming they must have been smaller than planned pieces. No one knew this of course except for me the next day when my mom gave me the wrapped up top layer for us to freeze... oh well now we get 2 cakes on our 1 year! 6. Reception glitch. We had planned to share a video/slideshow during our reception and had co-ordinated with the DJ and venue to make sure it would all work. When they went to play it, the DVD started in the middle. Bummer! Then when they got it back to the beginning the sound didn't quite match up. All in all, not a big deal, everyone LOVED the video, and it was one of those things where no one else probably noticed. 7. Sparklers got lit too soon. Yikes, that sounds scary! You know what they say, the best laid plans. I had it all planned out, had B instruct the groomsmen on the exact procedure, told them to wait for us to be standing there to start lighting. Well, I don't even know who's "fault" it ended up being, but somehow a lighter got into someone's hands and they started going at it! Luckily we had the 36" sparklers that burned for 4 minutes so we were able to make it out in time to do a few passes through the sparkler tunnel. Once again, it all worked out, it just wasn't how I planned it. Oh jeez. I would have freaked at the blood on the wedding dress!! Glad it ended up being ok!